We're so grateful to be a part of such a strong community. Little Wolfe’s Pet Resort opened the door 32 years ago on October 1, 1986. Ann E. Wolfe received her Bachelor’s degree in Interior Design from the University of Alabama in 1980, after working in the field for 6 years, decided to change professions. She wanted something to do with pets so she could keep her Labrador Retriever puppy with her all day— hating the idea of leaving her home alone. Based on the advice of a trusted friend, she attended a strenuous program in New York City to learn what she needed to handle in order to be a successful groomer. Once completing the program, she returned to the place where she was born and raised: Winter Haven. Starting the business was rocky, it took her 2 and a half years of persistent flyer dropping to get to place where she needed to really expand. The risk presented itself: she would have to buckle down and build the facility she knew she needed for her business. Believing in herself paid off, she had 2 employees to take care of and the trust of an entire town to earn, but she earned it. Within a year she had trained the two employees to handle each other’s workloads, doubling their productivity, and found a need to hire a third employee. The expansion continues; in just the last three years, she’s added Camp Little Wolfe’s Doggy Daycare. She’s created a separate large breed play area as well as a small breed play area. She’s also brought in an abundance of great people making up a solid team that’s more like family than a hired staff. Ann credits her success with the realization that the best way to build a business is to treat people the way she would want to be treated, and to always go out of her way to make people happy. of experience, Laura has now been grooming for 25 years. has 4 grandsons and 3 Chihuahuas. since. She is a mother of 2 young handsome boys and 2 dogs. with pets that need the most transforming, those that will be a drastic change. of 2006. 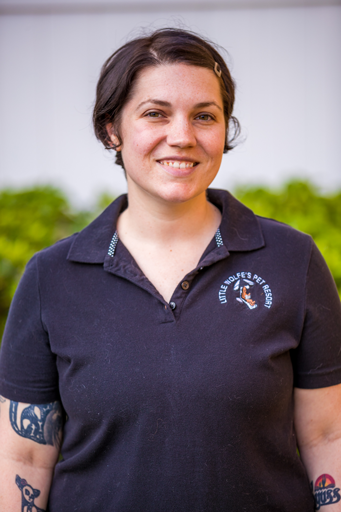 Ann realizing her passion for animals and dedication to Little Wolfe’s promoted her to Manager in April 2011. Treva is also one of our cat groomers and takes pride in all tasks. Treva is the mother of one son and 4 dogs and 2 cats. March of 2010 Ann realized her dedication and trained her to be a groomer. with all pets. 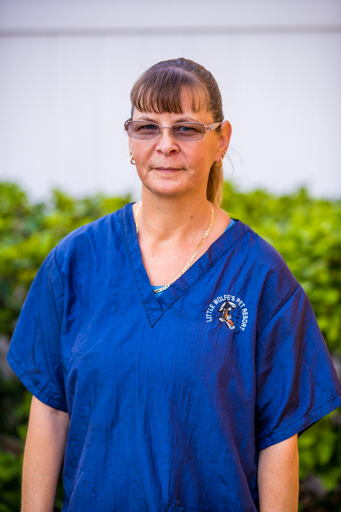 Alycia’s special skill is working with the timid pets, those that need extra time to make them feel comfortable and safe with the grooming process. She is the mother of one daughter and 4 dogs. Brandon joined us in May of 2016 as a Kennel Tech/Daycare Attendant and Bather. He is a pet person from the minute he steps out of bed in the mornings. He meets and greets each pet as if he has known them for a lifetime. Brandon is also a very bright college student and organizes his time between studies and work with a very professional attitude. 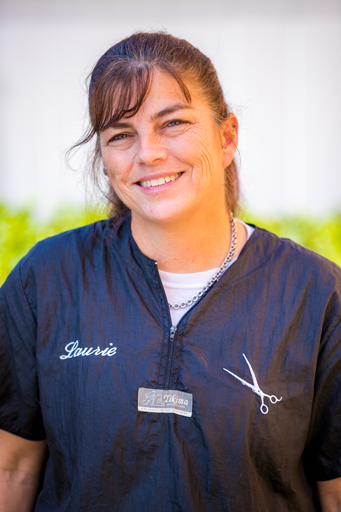 Laurie has been grooming for 26 years and came to us as a part time groomer in June of 2015.
and is an asset to Little Wolfe’s. in December of 2015 we realized her qualities to become a receptionist. does an excellent job at both. Jacob joined team Little Wolfe’s in March of 2016 coming all the way from California, Jake is retired US Army where he was a Communication Specialist serving time in Iraq. After leaving the Army Jake became the manager of Posh Pet Care in West Hollywood, CA. overseeing groomers, daycare attendants and training. Jacob is now a student at PSC and has a great passion for pets. loves getting to know the clients and makes them comfortable leaving their pets in our care. First known as Zoro by his previous owner came to Little Wolfe's 3 years ago at the age of 3. His original owner became ill and no longer could care for him. His owner wanted Ann to find him a home but deep down she wanted him to become the mascot of Little Wolfe's Pet Resort. Well, he settled in and warmed everyone's heart and is now the in house feline.